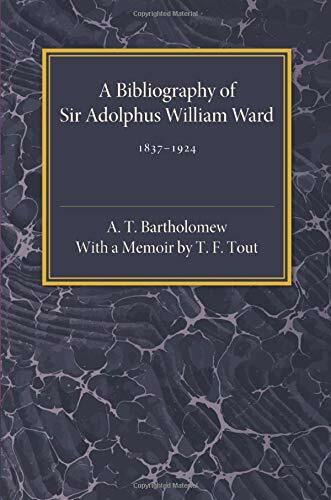 Originally published in 1926, this book presents a comprehensive bibliography of works by the renowned historian and literary scholar Sir Adolphus William Ward (1837–1924). A concise memoir of Ward is also provided, together with a table of principal dates. Originally published in 1926, this book presents a comprehensive bibliography of works by the renowned historian and literary scholar Sir Adolphus William Ward (1837–1924). A concise memoir of Ward is also provided, together with a table of principal dates. Whilst most well known for his History of English Dramatic Literature to the Age of Queen Anne (1875), Ward produced works on a broad range of historical and literary areas, notably in relation to Germany. This book will be of value to anyone with an interest in the writings of Ward, literary criticism and European history.